Force Pro Referee Jersey w/ Orange Armbands - Womens is rated 5.0 out of 5 by 1. Next to a shirt with concentric circles, nothing paints a bigger target on your back quite like the black and white vertical stripes of a referee jersey. Wearing Force’s Pro Referee Jersey makes doing your job feel much more, well, official. 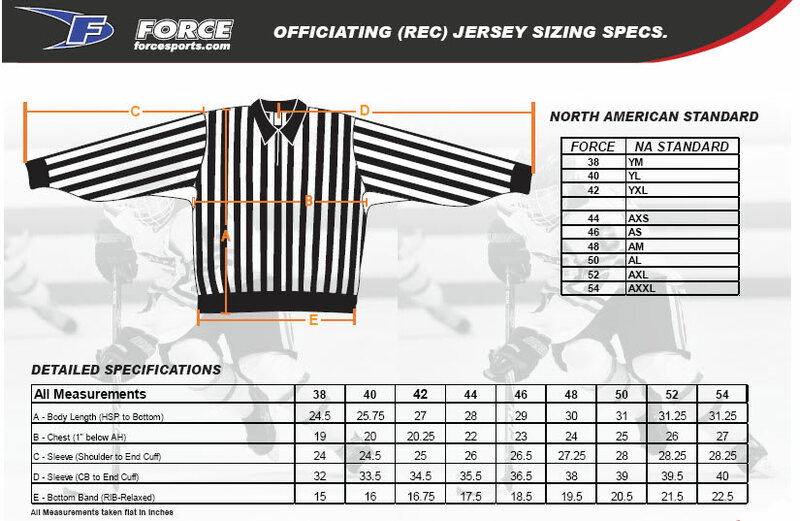 This pro-style officiating jersey is manufactured for top-level on-ice officials and the unique demands placed upon their equipment. Constructed of proprietary 100% polyester knit with double-stitched seams, this jersey has orange armbands sewn in to the extra-wide sleeves. The collar, cuffs and waistband are all made from F-Stretch™ spandex, guaranteed not to shrink, curl, or stretch out of shape. A Ragland-style shoulder allows the armband to be positioned in the correct location on the bicep, as well. Don’t kid yourself—those well-known stresses aren’t ever going to go away as long as you’re blowing your whistle with one arm raised. That’s part of the job. You might face some verbal abuse, but the woman wearing a Pro Referee Jersey from Force always gets the last word. Rated 5 out of 5 by Refgirl20 from I love referees I have 3 referee jerseys! I'll wear 1 of them tomorrow.